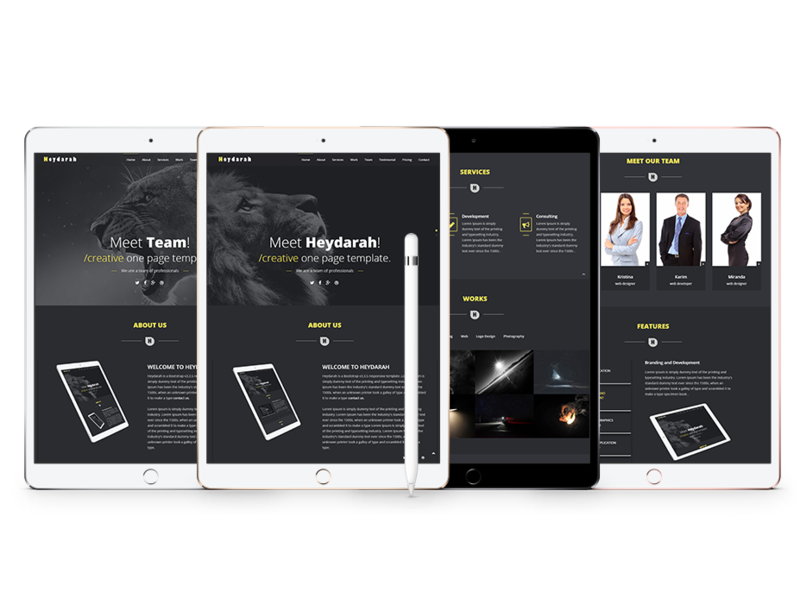 Heydarah is a Creative & One Page Portfolio HTML5 Template. It’s Fully Responsive based on Bootstrap 3. All files and code have been well organized and nicely commented for easy to customize. We have included full documentation ( Commented each and every sections ). We believe – we have covered everything you need to setup for Personal Portfolio. agency, architect, business, clean, corporate, creative, minimal, modern, profesional portfolio, photography, portfolio website, but if there is something that you would like to know then we are happy to help you out. After unzip Theme Files, you will found Theme Folder . You can view this Theme in any web browser from your desktop computer. Because the files are written in HTML, you do not need an internet connection in order to display or edit the Theme. The exception is the contact form which functions based on the PHP coding language and requires a server to send messages. Locate the domain folder you wish to upload your Theme files to on your server. You are going to want to click and drag every file that you have labeled .html, .css, .php, .js into your FTP client. Once the files are done uploading, rename the file you want to be your home page as 'index.html'. to Turn Off Preloader Screen Open the index.html file using any text editor. Now look for the following code and remove them. To change the image in 'Slider Home Section' put your image (recommended size 1600px * 800px) in 'img/homeslider' folder. Then open the index.html file using any text editor. We recommend Sublime Text. Now look for the following code and replace highlighted text with your image name+your image extension like this (name.png or name.jpg). To edit the text in 'Slider Home Section' Open the index.html file using any text editor then look for the following code and replace highlighted text. To change icons in 'Team Section' Visit This Page to get more icons. To change Logo in 'Navbar Section' put your image (recommended size 279px * 27px) in 'img' folder. Then open the index.html file using any text editor. Note: Don't forget to change the alternate alt="Heydarah" with your new logo name. To change the highlighted icon between divider in 'About Section' put your image (recommended size 50px * 50px) in 'img' folder. Then open the index.html file using any text editor. Now look for the following code and replace highlighted text with your image name+your image extension like this (name.png or name.jpg). Note: Don't forget to change the alternate alt="Heydarah" with your new icon name. To edit the text in 'About Section' Open the index.html file using any text editor then look for the following code and replace highlighted text. Note: You can edit all text by the same steps. To change the image in 'About Section' put your image (recommended size 528px * 435px) in 'img/flexslider' folder. Then open the index.html file using any text editor. Note: Don't forget to change the alternate alt="Heydarah" with your new image name. To change icons in 'About Section' Visit This Page to get more icons. To change the highlighted icon between divider in 'Services Section'. To edit the text in 'Services Section' Open the index.html file using any text editor then look for the following code and replace highlighted text. Note: You can change all items by the same steps. To change icons in 'Services Section' Visit This Page to get more icons. To change the highlighted icon between divider in 'Works Section'. To change images in 'Works Section' put your image (recommended size 400px * 300px) in 'img/works' folder. Note: You can change all works images by the same steps. To change image title and the text on hover it in 'Works Section' open the index.html file using any text editor. Now look for the following code and replace highlighted text with your new image title. To change the highlighted icon between divider in 'Team Section'. To change images in 'Team Section' put your image (recommended size 228px * 343px) in 'img/team' folder. Note: You can change all team images by the same steps. Note: Don't forget to change the alternate alt="Team Member" with your new image name. To edit Links in 'Team Section' Open the index.html file using any text editor then look for the following code and replace highlighted text. Note: You can change all team links by the same steps. For Example: replace "#" with "http://www.example.com"
To edit the text in 'Team Section' Open the index.html file using any text editor then look for the following code and replace highlighted text. Note: You can change all team text by the same steps. To change the highlighted icon between divider in 'Features Section'. To change the image in 'Features Section' put your image (recommended size 927px * 701px) in 'img/features' folder. Then open the index.html file using any text editor. Note: You can change all Features Section images by the same steps. Note: You can edit all Features Section text by the same steps. To change the highlighted icon between divider in 'Facts Section'. Then open the css/main.css file using any text editor. To edit the numbers Value in 'Facts Section' Open the index.html file using any text editor then look for the following code and replace highlighted text. Note: You can change all numbers values by the same steps. To edit the text in 'Facts Section' Open the index.html file using any text editor then look for the following code and replace highlighted text. Note: You can change all counter-item text by the same steps. To change icons in 'Facts Section' Visit This Page to get more icons. To change the highlighted icon between divider in 'Testimonial Section'. To edit the text in 'Testimonial Section' Open the index.html file using any text editor then look for the following code and replace highlighted text. Note: You can change all Testimonial text by the same steps. To change images in 'Testimonial Section' put your image (recommended size 100px * 100px) in 'img/testimonial' folder. To change the highlighted icon between divider in 'Pricing Section'. To edit the price in 'Pricing Section' Open the index.html file using any text editor then look for the following code and replace highlighted text. Note: You can change all prices by the same steps. To edit price features in 'Pricing Section' Open the index.html file using any text editor then look for the following code and replace highlighted text. Note: You can change all prices features by the same steps. To change the highlighted icon between divider in 'Blog Section'. To change images in 'Blog Section' put your image (recommended size 740px * 460px) in 'img/blog' folder. Note: You can change all blog images by the same steps. To edit the text in 'Blog Section' Open the index.html file using any text editor then look for the following code and replace highlighted text. Note: You can change all Blog Section text by the same steps. To change the highlighted icon between divider in 'Contact Section'. To edit the text in 'Contact Section' Open the index.html file using any text editor then look for the following code and replace highlighted text. To change icons in 'Contact Section' Visit This Page to get more icons. To turn on contact form Open the sendmail.php file using any text editor then look for the following code and replace highlighted text and save the file. To change links of social icons in 'Contact Section' Open the index.html file using any text editor then look for the following code and replace highlighted text. To change the google map to your location open the custom.js file in 'js' folder and search for the following code and replace highlighted text with your own google map code and save the file. To change Logo in 'Footer' put your image (recommended size 114px * 48px) in 'img' folder. To change links in 'Footer' Open the index.html file using any text editor then look for the following code and replace highlighted text. If you have any questions that are beyond the scope of this help file, please feel free to Contact Me. Thanks so much! Design and Developed by Karim Ezzat. Copyright © 2018. All Rights Reserved.